If you have been advised to use a light box for phototherapy to treat your circadian rhythm sleep disorder or seasonal affective disorder (SAD), you may wonder how to use a light box effectively. How can light improve insomnia and morning sleepiness experienced by night owls or winter depression in northern latitudes? Learn about the proper use of a light box, what timing and intensity of therapy is most effective, and alternatives to consider such as exposure to natural morning sunlight. There are a number of options available for light boxes and selecting the right one may take some research. There are even light therapy glasses available. It is important to select a light box that provides at least 10,000 lux of light in the full spectrum. Blue light seems to be most important for shifting the patterns of sleep, and some devices focus on this wavelength. If the light is delivered directly into the eyes, a lower intensity may be adequate. During phototherapy treatment with a light box, your eyes should remain open. It is best if the light is incidental to your sight (meaning shining on your eyes from the side). The benefits of a light box occur at the periphery of our vision. This means instead of staring directly into the light box, set it off to the side and look toward something else. You may want to eat breakfast, brush your teeth, watch television, use your computer, or read while you are using the light. If you experience a night owl tendency with delayed sleep phase syndrome, you will want to get this light exposure immediately upon awakening in the morning. It is recommended that you start with one 10- to 15-minute session of light exposure per day upon awakening. Some light boxes come with a timer to help manage your sessions. This can gradually be increased to 30 to 45 minutes per day, depending on your response. Most people use the light box for 15 to 30 minutes daily upon awakening and typically see a response over several weeks. Alternatively, consider getting exposure to morning sunlight immediately upon awakening. It is best to get 15 to 30 minutes of light exposure right after waking. This is especially helpful if you can naturally do this by simply going outside, but this may be difficult in the winter months in certain northern locations. For those with a misaligned sleep schedule from a circadian rhythm disorder, the use of a light box may be helpful to shift your sleep to the desired time. For example, if you are falling asleep too late and are sleeping in or excessively sleepy in the morning (a sign of delayed sleep phase syndrome), you should use the light box in the morning. This conditions affects about 10 percent of people and often begins in teenagers. If you are falling asleep too early and wake before you desire to (a sign of advanced sleep phase syndrome), the light box can alternatively be used in the evening. If effective, these treatments will be lifelong, but they may only be needed seasonally. Seasonal affective disorder, or winter depression, will respond best to morning use of a "happy light." In the case of SAD, light box therapy should be continued until natural exposure to sunlight normalizes, sometime in the spring. If it is effective, individuals with SAD will require lifelong treatment restricted to the winter months. What Are the Side Effects to Treatment? 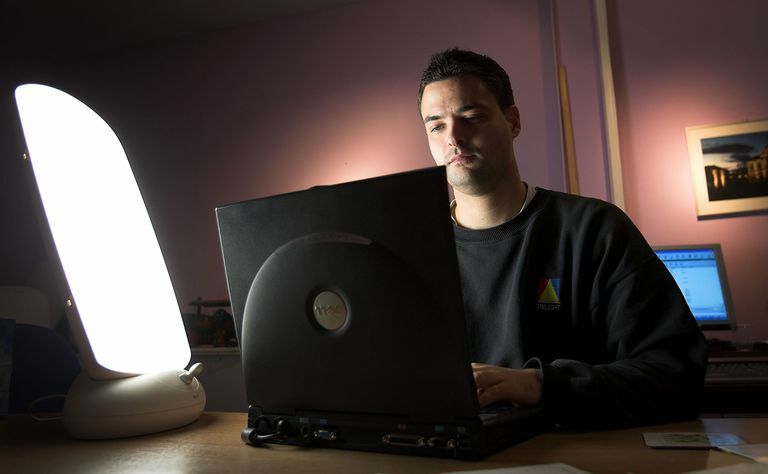 Light therapy has very few side effects and is usually well-tolerated. If your symptoms are persistent, you may wish to increase the exposure to twice per day. It is typically recommended that you not exceed 90 minutes per day, however. If you have persistent problems, you may need further evaluation by your doctor or a board-certified sleep physician and alternative treatments including the use of medications or therapy, so reach out to get the help that you need. If you are feeling particularly depressed and have thoughts of suicide, call the national suicide prevention lifeline at 1-800-273-8255. Eastman, CI et al. "Bright light treatment of winter depression: a placebo-controlled trial." Arch Gen Psychiatry. 1998;55:883. Golden, RN et al. "The efficacy of light therapy in the treatment of mood disorders: a review and meta-analysis of the evidence." Am J Psychiatry. 2005;162:656. Terman M et al. "A controlled trial of timed bright light and negative air ionization for treatment of winter depression." Arch Gen Psychiatry. 1998;55-875.